I hope you’ve all had a great weekend. We got to try out a new cafe/bakery for lunch (and a treat of course!) and aside from some crafting, I also went to a Fountain Pen meet up! I know you are probably thinking a what? There is a group for fountain pen collectors and enthusiasts that meets in Austin on a monthly basis. I’m relatively new to the world of fountain pens so a lot of the discussion was way over my head. I thought I had a nice little collection as I have seven Lamy pens and one Faber Castell and yes, my collection is nice but very small compared to the other attendees. I saw some of the members with pen cases holding at least 20 pens of all varieties and I believe someone had a pen worth $300. Wow. Unless I win the lottery I guess I won’t be buying a pen that expensive but it is fun to see the variety and to find out more about these famous pen companies. So between passing around pens and trying some different inks and then coming home and working on some stamping projects, my fingers have been constantly covered in ink all weekend! I love it though. I have to say there is something about writing in your journal with a fountain pen. I know some of you out there probably use fountain pens, any favorites or ink favorites? 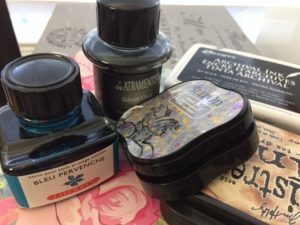 For those of you who would like more info, I strongly recommend visiting Goulet Pens – they have blogs posts dedicated not only to new products but also comparisons between inks and pens. Finally, did you know that February is InCoWriMo? That’s International Correspondence Writing Month. A month-long event encouraging you to write a letter every day. No emails or text – good, old snail mail! I’m late to the game of signing up but if you want me to send you a letter or postcard let me know. 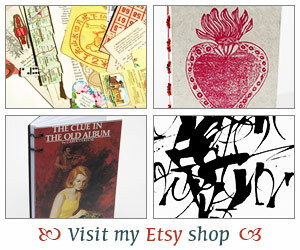 I’d love to surprise you with a little note and maybe even something from my crafty adventures. Just send me an email with your address and I will write you sometime this month! The InCoWriMo sounds like such a fun thing….but I know I’m not capable of writing a letter a day! I probably couldn’t even do a letter a month! Good luck with your letter writing and a hope you get lots of interesting replies! I’m not doing any of these challenges this year, but I AM continuing to write letters! I love decorating envelopes and creating my own postcards and have a letter to finish today and get in the mail. We went to the Lamy flagship store in Heidelberg! I don’t own one because it feels like a bit of a splurge, but they’re just the coolest. Neat that you guys have a group. I keep thinking I want to participate in the letter writing month event, but I always remember it too late. One of these years! I love the idea of fountain pens, but I have never used one. Ho cool–I had no idea there was such a thing–and even better that you live somewhere where you can go to these meet-ups! Pens and ink are so cool, but like you, I have to content myself with looking and admiring. I had no idea that it was international letter writing month–will have to send a card or two to international friends!